Ever been on a dino safari? The dinosaurs are unleashed in this exciting new theme! 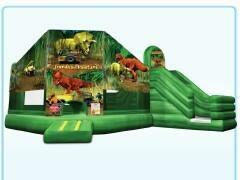 This unit features a bouncing area, amazingly-detailed digital graphics, a crawl-through, slide area and child-proof finger-safe netting.